JRI Orthopaedics are a Sheffield based company with world class expertise in the design, development and manufacture of orthopaedic implants and surgical instruments. Standard hip implants are usually manufactured by a combination of forging and machining to form the desired shape. The forging process requires significant investment, the costs of which can only be recovered by mass production and if there is a sufficient demand from patients requiring an ‘average’ size implant. However, when a bespoke size of implant is required, the low demand is not high enough to justify investment in the forging process. The traditional solution has been to either produce a one off batch of the required size which is neither; cost or energy efficient; or for surgeons to compromise with their patients on the best fit. JRI were particularly interested in the Mercury Centre’s (The University of Sheffield) capabilities and expertise in Additive Layer Manufacturing and the development of new innovative products using this new technology. The Mercury Centre guided JRI through the ALM process, its capabilities and the typical material properties obtained. In order to evaluate the material properties of ALM, the Mercury Centre devised an in-depth test programme, involving the manufacture of a series of standard lattice structures for strength and fatigue testing. By performing biological testing, the Mercury Centre were also able to assess the in vitro response of human bone cells to the test surface on the lattice structures. Cell response was evaluated by looking at cell metabolic activity, cell organisation and adherence to surfaces. As well as scientific analysis of surfaces, other considerations of the project included the integration of manufacture into the current production processes, manufacturing costs and regulatory requirements. 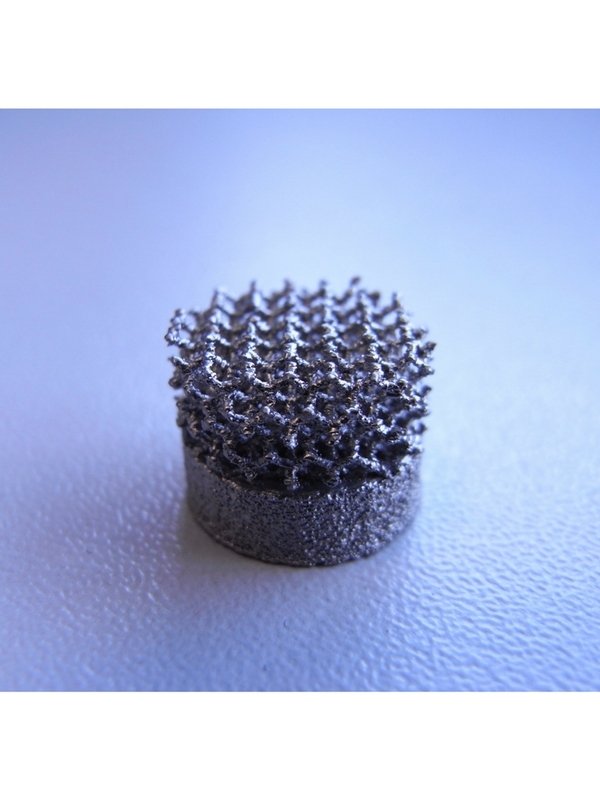 The test results from the ARCAM produced lattice structures clearly demonstrated that the new manufacturing technology of ALM has the capability to produce parts commensurate with the industry standards for orthopaedic implants and advantageous for bone in-growth. The next phase of work will show the repeatability of the process, allow for more mechanical testing and enable further benchmarking against standard production routes. It certainly helped me knowing that my work was applicable in the real world. I saw all elements of the company – design, process and manufacturing.